MANNY PACQUIAO: "IT'S GOING TO BE A BIG DIFFERENCE COMPARED TO THE LAST TWO FIGHTS"
"It's really important, but, you know, like I said, nothing personal. I'm going to do my job in the ring and make sure that I'm going to win the fight, and I will pray to God that nobody gets hurt and the fight will be successful...I don't think it's the same fight, you know. It's going to be a big difference compared to the last two fights that we had. This is going to be a good fight for me because of the weight and the style and the power is going to be different than compared to before. It's going to be a big difference," stated 8-division world champion Manny Pacquiao, who took time out of training camp to discuss his upcoming November 12 showdown with Juan Manuel Marquez. Check it out! 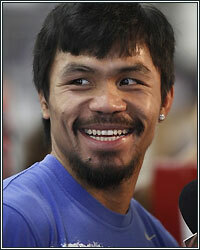 BT: Manny, thanks for taking a quick break from your training to speak with me. Is this fight with Marquez a little more personal for you than any of your other fights? MP: It's really important, but, you know, like I said, nothing personal. I'm going to do my job in the ring and make sure that I'm going to win the fight, and I will pray to God that nobody gets hurt and the fight will be successful. BT: Does the fact that Marquez thinks he should have won the last fight motivate you to really make a statement in this fight? MP: I don't think that's what he thought, but, you know, people know I was going to win the fight, but we cannot blame him or his variation, you know. He has the freedom to make alibis. BT: With this fight taking place at a much higher weight, are you expecting the same type of fight with Marquez as the last two fights? MP: I don't think it's the same fight, you know. It's going to be a big difference compared to the last two fights that we had. This is going to be a good fight for me because of the weight and the style and the power is going to be different than compared to before. It's going to be a big difference. MP: (Cutting in) We don't have a problem about that because we train and we practice difference moves, inside and outside, and we're not worried about that. BT: Obviously people are going to compare your performance against Marquez to Floyd Mayweather's fight with him in 2009. Are you hoping to look better than Mayweather did. MP: I'm not comparing my fight to anybody. I'm just happy that I'm giving enjoyment and happiness to the people and contribute, you know, an exciting fight to the fans.